Seventy Years with Messrs. I. and R. Morley. Calverton veteran was still at the frame at the grand age of 83! In 1858, Robert Harrison, a lad of 13, started work "in" a hand frame knitting machine at Calverton ---- which of course is the home of the inventor of the machine, the Reverend William Lee. He was working for Messrs. I. and R. Morley, of Nottingham. By 1928, some seventy years on, he was still to be found at Bottom Buildings, Calverton, at the self-same machine in his little home --- still working for "Morley's." Mr Harrison was a remarkable man. Just as remarkable was the fact that he could still follow his craft --- a feat that he was justly proud of --- was his ability to have such a retentive memory. His memory was extraordinarily vivid. He could recall when the ghastly crime of garrotting was prevalent in the country, and a case occurring in Nottingham, in front of the Mechanics Institution. He laughingly recalled that if he failed to carry his cap, on walking down Sheep Lane (Market Street), he would have no cap on at all when reaching the bottom of the hill. He could recall when the ghastly crime of garrotting was prevalent in the country, and a case occurring in Nottingham, in front of the Mechanics Institution. He laughingly recalled that if he failed to carry his cap, on walking down Sheep Lane (Market Street), he would have no cap on at all when reaching the bottom of the hill. Robert was a Sunday school worker at the Calverton Wesleyan Chapel for almost 55 years, and superintendent for about 30 years. A post he still retained. It angered him when he found it necessary to take his glasses with him to Sunday school for the first time. Mr Harrison's wife, who passed away in 1925, was just as wonderful a woman as he is a man. She began work at the age of 10, and remained "in the frame" --- as stockings say --- until she was 77. "She was one of the cleverest stockingers in the world. She made everything. She was just as enthusiastic a cricketer as the men. She could play like a man, and could field as sharp as a needle." Was his tribute to her. Mr Harrison all his life has been --- even to this day --- an enthusiastic cricketer. At 83 he still tried his hand at the game. He has batted at Oxton this season, and caught the 8.30am bus to Nottingham last week to see Notts at Trent Bridge. There was a love of cricket in the family. 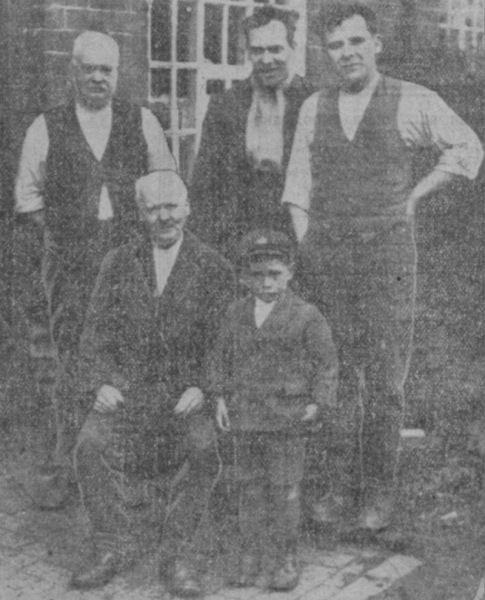 His son, Isaac, played for the Notts first eleven in 1901. Indeed, he took part in the memorable match when Notts skittled Yorkshire out for 13. Another son, Matthew Henry, also played professional cricket for about 10 years with Chelmsford, Densby Main, Co. Kildare, Repton School, and Helston. Cholmondeley was his first club. He was then 19. This son, who was now 55, works "in the frame" with his father at their cottage home, as did one representative of the third generation --- Hedley Harrison. The object of this sketch was born at Woodborough. His parents moved to Calverton when he was ten months old and Calverton had since been his home. 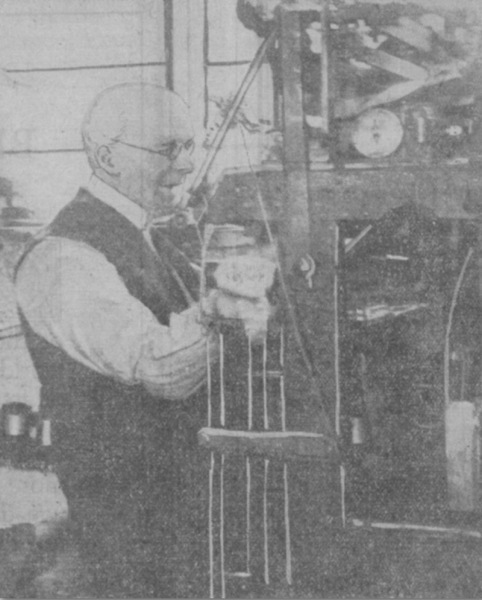 His father worked "in the frame" for Morley's for over 50 years, and so did his wife's father. The family have had hose to seam for Queen Victoria. In 1893, Matthew had to go to a 33-gauge three-needle frame to fulfil an order for Princess Maud. When Robert first went to work there was between 200 and 300 stockingers in Calverton and he heard talk of days when there was even 400. By 1928, the number left was less than 20. The old order changeth. 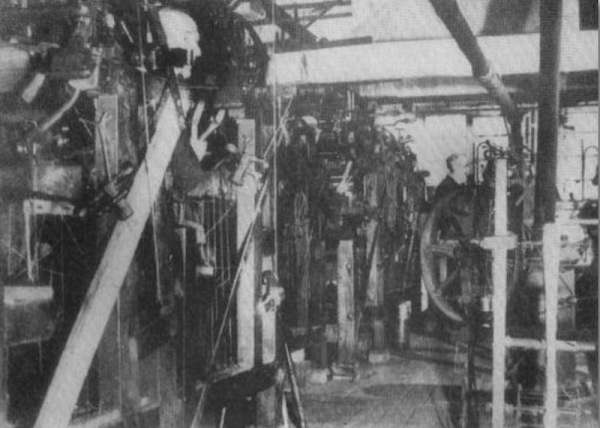 The machine era was ousting the handworker. 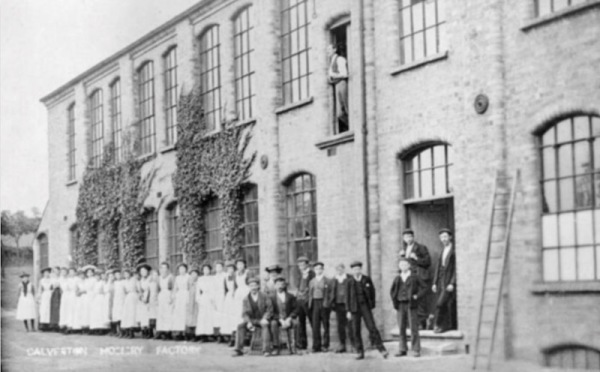 There was now an up-to-date hosiery factory in the village, employing 150 people. 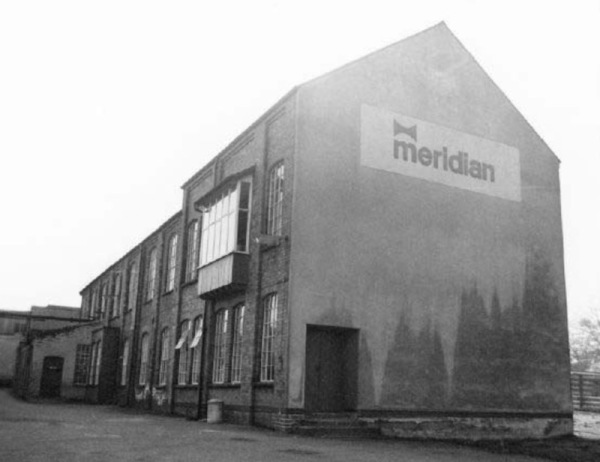 This factory belonged to Mr Coggan, of Nottingham, and Mr Harrison's daughter was married to Mr R. Fisher, the manager. Mr and Mrs Harrison walked from Calverton to Nottingham and back many times, and had spent thousands of hours in the old carrier's van. They used to leave at 8.30am and were lucky to get to the Welbeck by quarter to 12. Mr Harrison's uncle George was a Chartist in the Feargus O'Connor days, and he knew the inside of a prison on account of his principles. During the stockingers' strike, many years ago, the Calverton stockingers refused to cease work. Someone put a bomb through the window of the Harrison's house straight on to one of the machines. The bomb exploded and blew a piece out of the ceiling and out of the door. Bullets were fired by a mysterious individual who came to reside in the village. Robert, had a peephole in his door so on the approach of the enemy he could escape through the window. The final links with Calverton's clothing past were finished on the infamous date of September the 30th 1991. On this date the Main Street factory mysteriously burnt down, and so a golden age was lost forever.